THE IRISH FARMERS’ ASSOCIATION (IFA) will stage a protest on Monday morning at Dublin Castle as the EU Commissioner for agriculture and rural development arrives for a meeting on reform of the Common Agricultural Policy (CAP). The IFA has criticised the Minister for Agriculture Simon Coveney after a meeting with him in Cork yesterday afternoon following a protest outside the minister’s constituency office. The association estimated up to 2,000 people from around the country travelled to Cork for the demonstration. Speaking to TheJournal.ie, Henry Burns, who is a farmer in Laois and National Livestock Chair for the IFA, said the association did not receive “a satisfactory answer” from the minister on the issues they raised. Burns said the proposed changes to the way in which the direct payments to farmers are distributed could mean a 40 or 50 per cent cut for some people. The new payment method would see farmers receive payment based purely on the amount of land they own, as opposed to the level of productivity which is taken into account in the current system. Your average farmer on 32 hectares of land, some of those would receive around €14,500 but they’re very productive with suckler cows and producing beef and they’re increasing their production. The commissioner’s proposal would go close to taking almost half of that from a person who is by no means a huge farmer. His salary might only be around €14,000 in total so he’d be depending on the payment to keep the farm going and keep up that productivity. Burns said this will see the most productive farmers losing a significant proportion of their payment as factors like the amount of work they do, the investment they’ve made in buildings or the fertility of the land will not be taken into account. He said farmers feel that the minister has let them down and is not representing their interests in Europe. “He seems like a very good communicator and a lot of people would have been proud to have him as minister of agriculture but now it’s time for him to prove himself,” Burns said. “No amount of spinning will explain to a farmer why he goes down 40 per cent and can’t afford to keep going”. Email “Farmers to stage protest during visit by EU agriculture commissioner”. 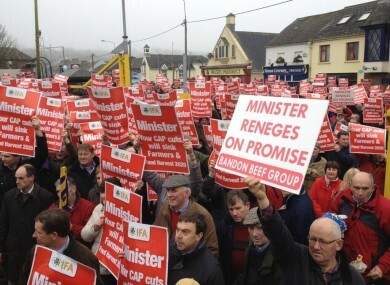 Feedback on “Farmers to stage protest during visit by EU agriculture commissioner”.